Fishing In Thailand ....And One or Two Other Countries Too! : We Need to Correct a Terrible Error!!!!! We Need to Correct a Terrible Error!!!!! www.fishinthailand.com and I'm Going Fishing and myself, Chris Allnatt, have made a terrible blunder which we need to correct right away. It was erroneously written (by us) that the Pacu is not related to the Piranha. As it turns out they ARE related, so we couldn't have been any wronger than we were. Thanks to Dave Fox, owner of Pai Piranha Fishing Park, for pointing out our gaffe. Pacu (Portuguese pronunciation: [paˈku]) is a common name used to refer to several common species of omnivorous South American freshwater fish that are related to the piranha. Pacu and piranha do not have similar teeth, the main difference being jaw alignment; piranha have pointed, razor-sharp teeth in a pronounced underbite, whereas pacu have squarer, straighter teeth, like a human, and a less severe underbite, or a slight overbite. 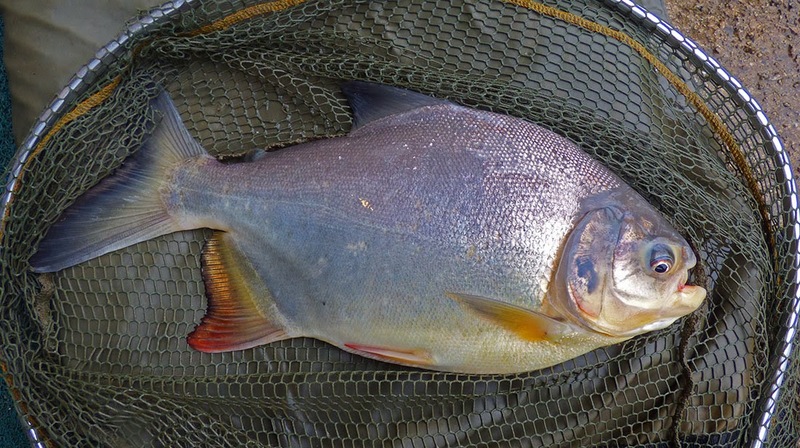 Additionally, full-grown pacu are much larger than piranha, reaching up to 0.9 m (3 feet) and 25 kg (55 pounds) in the wild. Pacu are commonly sold as "Vegetarian Piranhas" to home aquarium owners. With the proper equipment and commitment, pacu have been known to make responsive pets. One such example was Swish, a 75-cm (30-inch) pacu owned for over 20 years by a Chinese restaurant (Kau Kau) in the Chinatown district in Seattle, Washington; one aquarium technician said of Swish, "He'd rub his body on your arms, kind of like a dog." However, there is some question of whether the fish are a good choice for the typical hobbyist. While they are not aggressive carnivores like the piranha, their crushing jaw system, used primarily for eating seeds and nuts, can be hazardous. One toddler needed surgery after a pacu (misreported as a piranha) bit her finger at Edinburgh Butterfly and Insect World in Scotland. Commenting on the incident, Deep Sea World zoological manager Matthew Kane warned, "Pacus will eat anything, even children's wiggling fingers." Giant Siamese Carp. I am most pleased! Fishing at Teak Tree Lake - successfully! 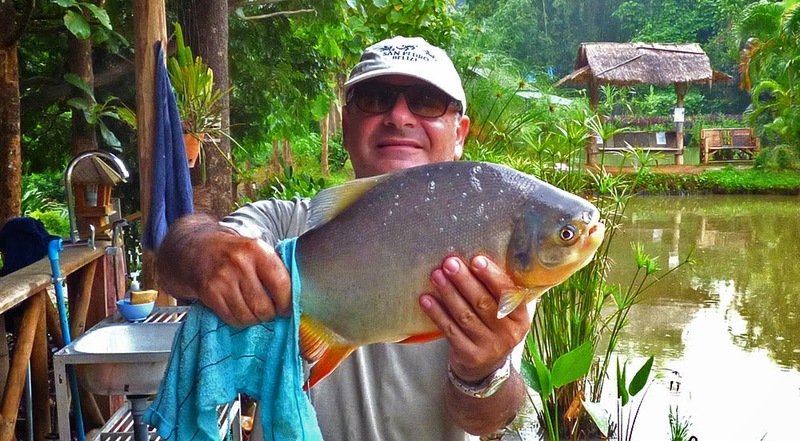 Records Tumble at Pai Piranha Fishing Park! Well, BLEH! No fish caught today. Chiang Mai Birdsong. Thai Chicks are Hot!